You are currently browsing the tag archive for the ‘Young Living’ tag. Two weeks: Open for Reiki, etc. Silly me, I just realized I was on vacation. In my mind I was thinking I still had a week to go but in fact, I’m free of all mundane obligations to my real estate position. That leaves time for other things and I would love to devote some of that time to folks who were in need of some healing or face time for guidance, Essential Oils, or what not. Please contact me if you are in or going to be around the area. I will be gone for the actual “Christmas Holiday” DAY but pretty much home-centric for the rest of the month, including New Years which I will spend with my lovely friends at Santee Court. Send me an email or give a poke or gab on facebook and I’ll respond as soon as humanly possible. Hoping you have weathered this retrograde and the holiday’s. A bit of promotion from Lifencompass / Young Living. 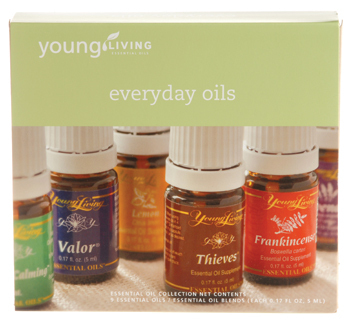 Among my many favorites from YL Essential Oils I found some great little combo-packs on the holiday market. Valor info. Peppermint info. Peace and Calming info. Includes one 5 ml bottle each of Thieves®, Purification®, and R.C.™ to purify and cleanse your home. Comes wrapped in an elegant cream-colored gift box with a red bow. Purification info. Thieves info. R.C. info. Includes one 5 ml bottle each of lavender, lemon, and grapefruit to create an inviting atmosphere and lift holiday spirits. Comes wrapped in an elegant cream-colored gift box with a purple bow. Lemon info. Lavender info. Grapefruit info. There are other great gift ideas in the Season Essentials catalog (pdf) and, of course, I’m around facebook and twitter for Q&A. You can also check out the complete product catalog here by clicking “pages.” (PDF download). If you are interested in ordering this or any essential oil you can sign up at Young Living, or contact a distributor in your area. Customer: beginning to reap the benefits of the YL Product line. Preferred Customer: signing up for a customizable monthly “auto-ship” program, you gain a discount on the cost of your oils and begin to receive free learning materials and essential oil rewards. Distributor: Visit the distributor page for more information. If my member number isn’t automatically entered in the referral field, kindly enter the following number. You will then create a user name and password, account, etc and then you can begin ordering Young Living Essential Oils. If you have further questions or want more information please send me a note. I’m in the Downtown Los Angeles area and I’m happy to include your order in our community order here at Santee Court. You must be local, please email me for details. General characteristics. Garden Thyme is a cultivated shrub-like plant with 10-20 cm high, woody, brown trunk and upright, square and hairy arms. The leaves are cross-opposite, sessile or short stemmed, lancettlika, ovate, more or less strongly hairy and furled at the edge. Flowering period is from June to August. This species should not be confused with the so-called wild thyme, Thymus serpyllum L., who is a perennial, scrubby, fragrant plant with creeping, hairy stems, small oval lancettlika, over-wintering leaves and bright red, usually 6-flowered flower wreaths in the stem. “Thyme was called thymos by the Greeks, which meant “fumigate”. 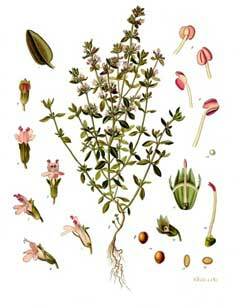 They associated thyme with valour in battle, and the restoration of physical power. Roman soldiers were known to bathe in a decoction of thyme before going into combat, to boost strength and courage. The Sumerians used it as an antiseptic, and in Egypt, thyme was one of the herbs which was used in the mummification process. Culpepper recommends using thyme as a treatment for whooping cough. Powers: Health, Healing, Sleep, Psychic Power, Love, Purification, Courage. Magical Use: Burned to attract good health and is worn for this purpose. It is also used in healing spells. Placed beneath the pillow, it ensures restful sleep and a pleasant lack of nightmares. Worn, Thyme aids in developing psychic powers, and women who wear a sprig of thyme in the hair to make themselves irresistible. Thyme is also a purificatory herb; the Greeks burned it in their temples to purify them and so thyme is often burned prior to magical rituals to cleanse the area. In spring, a magical cleansing bath composed of marjoram and thyme is taken to ensure all the sorrows and ills of the past are removed from the person. Thyme is also carried and smelled to give courage and energy. If you wear it you will see fairies. ~Encyclopedia of Magical Herbs, page 242-243, Scott Cunningham. Other books by Paul Beyerl and even the Modern Herbal mention the use in strength, courage, fairy folk and it’s purification properties. Remember you can work with herbs and plants on many levels. You do not need an apothecary, you don’t need to be an “alchemist” to practice herb craft. My golden rule with working magick (in cooking, aromatherapy, or magickal practice) is to connect with the spirit of the plant / herbs that you are working with to unlock their potential. You are the key that awakens the energy in your food or spell. There is a mother or father spirit for every green thing. Ancient Egyptians used thyme for embalming. The ancient Greeks used it in their baths and burnt it as incense in their temples, believing that thyme was a source of courage. It was thought that the spread of thyme throughout Europe was thanks to the Romans, as they used it to purify their rooms and to “give an aromatic flavour to cheese and liqueurs”. In the European Middle Ages, the herb was placed beneath pillows to aid sleep and ward off nightmares. In this period, women would also often give knights and warriors gifts that included thyme leaves as it was believed to bring courage to the bearer. Thyme was also used as incense and placed on coffins during funarels as it was supposed to assure passage into the next life. ~Wiki Link and more information. Thyme (Thymus vulgaris) has a spicy, warm, herbaceous aroma that is both powerful and penetrating. Known since ancient times as a medicinal herb, thyme contains large amounts of thymol. As a dietary supplement, it is one of the strongest antioxidants known. Thyme supports the immune, respiratory, digestive, nervous, and other body systems. * Thyme may also be used to enhance the flavor of food. Thyme has an approximate ORAC of 159,590 (TE/L). TE/L is expressed as micromole Trolox equivalent per liter. Thyme Essential Oil – 15 ml. Thymol has been used to successfully control varroa mites and prevent fermentation and the growth of mould in bee colonies. A minor use is in bookbinding: before rebinding, books with mold damage can be sealed in bags with thymol crystals to kill fungal spores. Thymol has been used in alcohol solutions and in dusting powders for the treatment of tinea(ringworm) infections. Thymol was used to treat hookworm infections in the US. It is also used as a preservative inhalothane, an anaesthetic, and as an antiseptic in mouthwash. It is the active antiseptic ingredient in the toothpasteEuthymol. Thymol is an active ingredient in Listerine (R), present at the concentration of 0.64 mg/mL. Thymol has been found to be more effective when used in combination with chlorohexidine to reduce plaque and gingivitis than when used purely by itself. On its own, thymol has microbial activity because of its phenolic structure. It has shown antibacterial activity against bacterial strains including Aeromoans hydrophila and Staphylococcus aureus. The Bee Balms (Monarda fistulosa and Monarda didyma) are natural sources of thymol, a primary active ingredient in modern commercial mouthwash formulas. The Blackfeet Native Americans recognized this plant’s strong antiseptic action, and used poultices of the plant for skin infections and minor wounds. A tea made from the plant was also used to treat mouth and throat infections caused by dental caries and gingivitis. There is also evidence supporting the belief that thymol, when applied two to three times daily, can eliminate certain kinds of fungal infections that affect finger nailsand toe nails in humans. Regular application to the affected nail over periods approximating three months has been shown to eliminate the affliction by effectively preventing further progress; by simply cutting the nail as one normally would, all infected material is eventually eliminated. 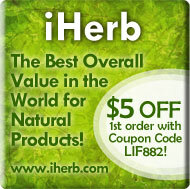 An alternative to Young Living for the price conscious can be found at iHerb.com. Though Young Living does tout the highest quality in essential oils, there are alternatives. Find Thyme Essential Oil at iHerb.com by by clicking here. Both Nature’s Alchemy (Red Thyme, $8.16, 15 ml) and Now Foods ($9.93, 30 ml) can be found there. I hope to continue to add these little herbals to the site, I encourage your constructive input as I admittedly am studying in areas where I am only a journeyman. The Dictionary of Modern Herbalism, compiled by Simon Mills M.A. Essential Oils Desk Reference, Essential Science Pub. I found this while crawling around on the web. I’ve been reading for hours so forgive my short commentary, at the moment. A neat article on the power of essential oils, Thyme, and Cinnamon. The essential oils of thyme and cinnamon were found to be particularly efficient antibacterial agents against a range of Staphylococcus species. Strains of these bacteria are common inhabitants of the skin and some may cause infection in immunocompromised individuals. Drug-resistant strains, such as meticillin-resistant Staphylococcus aureus (MRSA) are extremely difficult to treat. “Not only are essential oils a cheap and effective treatment option for antibiotic-resistant strains, but decreased use of antibiotics will help minimise the risk of new strains of antibiotic resistant micro-organisms emerging,” said Professor Samaras. via Essential oils to fight superbugs. It’s been awhile since I’ve written in any detail about essential oils and there are two reasons for that. First I had a few discussions with some (unfortunately) misinformed clients. Young Living Essential Oils are not air fresheners. You could use them as “air fresheners” but honestly, it’s a bit expensive. I also had some thoughts on the use of herbs magickally versus aromatherapeutically. Is there a difference? Does a plant essence create a different effect when used in Aromatherapy, versus traditional magickal purposes? From these two thoughts came the idea: Write about the Essential Oils, compare their use, record the results. We’re going to go through the blends first, they contain various essential oils, blended for a purpose. If I like the process, and IF it turns out that people enjoy the comparison, then I may dig into the single blends. We begin with Abundance. *From the Essential Oils Desk Reference, Chapter 8, page, 93. Essential Science Publishing. Increases the attraction of abundance and success. It enhances the frequency of the energy field that surrounds us through stimulation of the somatides. Somatides transmit frequency from the cells to the environment when stimulated through fragrance and thoughts. This frequency creates the “law of attraction,” a harmonic magnetic energy field around oneself. When focusing on issues of abundance and inhaling this oil, a memory link of the RNA template is created where memory is blueprinted and permanently transcribed. The Aromatherapeutic properties of the blend Abundance can help focus the mind to create the awareness of our power to “attract” what we want into our lives. The “Law of Attraction” is really just fancy marketing wrapped around ancient principles: Magick. The Law of Attraction, derived from the Hermetic Principles, and has a modern living from the late 1800’s. My point being, many of these new practices are old practices and you find that they are often missing key elements or core principles that explain and educate. All that said, I have used Abundance in a few ventures, including at the day job to increase various energies. Abundance doesn’t = money. It can be an abundance of anything unless the proper herbs / oils are brought together. In this case that is my question, how is Abundance blended? Let’s see how this blend is put together. Myrrh; Cinnamon Bark; Frankincense; Patchouli; Orange; Clove; Ginger; Spruce. The EO Desk Reference has an encyclopedic list of essential oils and their uses. I’m going to go through each EO and cross-reference to some other herbal sources to see how Abundance adds up. Note I’m skipping “medical” uses unless blends / EO’s are recommended for medicinal uses. (Commiphora myrrha) Promotes spiritual awareness and is uplifting. It has sesquiterpenes wich stimulate the limbic system of the brain (the center of memory and emotions) and the hypothalamus, pineal , and pituitary glands. So what we’re looking at here, from Young Living’s standpoint, is that the vibration of Myrrh is uplifting and carries a “spiritual frequency”. Myrrh, according to Paul Bereyl has both masculine and feminine qualities. Related to the Sun, Moon, Adonis, Aphrodite, Cybele, Demeter, Hecate, Juno, Rhea, and Saturn. Used to Consecrate, in magick and spiritual practices to mark occasions such as funerals, rites, and ceremony. Broadening our perception of energy, how it flows, and deepening our potential to connect to the mysteries. Frankincense (Boswellia carteri) has a sweet, warm, balsamic aroma that is stimulating and elevating to the mind. Useful for visualizing, improving one’s spiritual connection, and centering, it has comforting properties that help focus the mind and overcome stress and despair. Frankincense is considered the holy anointing oil in the Middle East, where it has been used in religious ceremonies for thousands of years. Seems to be another uplifting spiritual herb used to stimulate the mind and energize the energetic field. Frankincense and Myrrh have long been used together and as base for other incense. Patchouli (Pogostemon cablin), sometimes called “the scent of the sixties,” has a musky, earthy, exotic aroma. In Eastern cultures, it is commonly used around the house to provide general support for health and to help release negative emotions. It is a relaxant that clarifies thoughts, allowing the discarding of jealousies, obsessions, and insecurities. I love patchouli as it does have a cleansing property to it, however it can be quit dank. Patchouli resonates with Pluto and Scorpio, and strangely appears to be used in spells for love, and as an aphrodisiac. However burnt it can be used to attract money, and promote “fertility”. Here we begin to see the “abundance” properties of the blend. Orange (Citrus sinensis) essential oil has a rich, fruity scent that lifts the spirit while providing a calming influence on the body. Orange brings peace and happiness to the mind. There is a link here with happiness and attitude. So not only is the blend including money in the properties of the oil but “happiness” as well. So the feeling of Abundance increases the power of the blend by stimulating the mind with the cheerful scent of orange. 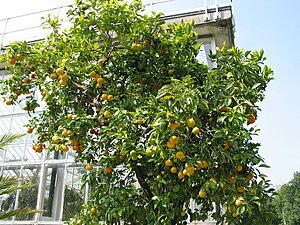 In addition to their fertility property, oranges have been used for luck, divination, and you guessed it, money. The list of folklore and uses of orange could probably fill a library considering they found all over the world. (Syzygium aromaticum) doesn’t seem to have a YL listing for abundant usage but does show that it stimulates a feeling of protection and courage, “stimulating” being a key word. Magickaly speaking clove appears to have association with money magick, as well as attracting lovers and insight through visions, and dreams. Young Living lists ginger as another stimulant with qualities associated for potency (fertility). 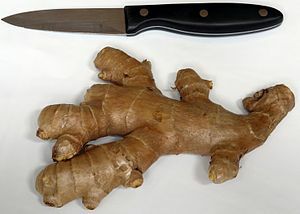 References abound for ginger but it does seem to have been used in both attraction and money magick. Paul Beyrel notes a resonance with Mars and that the herb is strongly associated with one’s health, with uses in magick that both strengthen and empower consecrated items. Spruce is included in one of my all time favorite EO blends, Valor. I use valor soap and I apply the oil to my feet and temple after bathing. It’s SO stabilizing, lifting up the vibration while encouraging as sense of being grounded. Well it seems that I don’t know a hill of beans about spruce, and it doesn’t seem (upon searching various sites) that I was able to find any spell related qualities of the evergreen. I personally feel that it (spruce) is related to the earth, the lungs (breath, air), grounding (manifesting), and cleansing. I’ll take a weigh-in by anyone familiar with usage of Spruce for spells / magick, naturally. So when I do add up the ingredients magickal vs. aromatherapeutic, it seems that Abundance is formulated for the very purpose of attracting money, wealth, and to lift the energy of one’s personal field by invigorating the mind, body and spirit. Naturally Aromatherapy creates benefits through our sense of smell, stimulating our mind-body, but there are other methods of applying essential oils to ourself, and for magickal/energetic purposes. With almost all things, including EO’s, I believe in working with the spirit or vibration first. Getting deep with myself and extending my senses into the essence, asking that it work for the betterment of my life, and through that life around me, and with the intent I wish to the essential oil for. This sets the stage for the working, naturally you should have already decided what you were attempting to manifest. With Abundance we would be looking for more money, income, or business (resulting in income) and be clear about the direction you would like for this to appear. In the past I’ve used Abundance in the office, as I said then we anointed stones by the door, and sprayed the essential oil around the office mixing (roughly) about 6-10 drops of EO to a large spray bottle and generously spreading it around the area in the mix. Again this is not an air freshener, and though the scent can stay in the air for hours I feel that it is more effective to wear the oil itself and/or diffusing the blend in the air with a proper essential oil diffuser (non-burning). You can also use Abundance in other ways such as in a small vial within a pouch or bag you have designed to attract more money. You can anoint candles for spell or ritual. You can trust your intuitive tug while and experiment with new ways to attract more money and “Abundance” into your life. *Please read instructions carefully when using ANY essential oil. You can find Abundance at the Young Living website, or check out the complete product catalogue here by clicking “pages.” (PDF download). If you have further questions or want more information please contact me here. I thought I’d post a few of my favorite blogs this Friday on health, and food. This blog spotlights the many uses of Eucalyptus Essential Oil. Young Living carries five types of Eucalyptus Oil. Check out the Healthy Haven and read up on how this essential oil may assist you in your healthy living. Antibacterial, asthma, arthritis, chicken pox, coughs, decongestant, fever, insect repellent, measles, migraine, muscle pain, rheumatism, shingles, sinusitis, sprains and throat infections. via Suggested Uses for Eucalyptus Essential Oil « The Healthy Haven. In our home my partner and I have personally felt and benefited from the use of essential oils. In their purest form to mixing in food, bath salts, in the diffuser and directly applied Young Living has created a beautiful and balanced product that has measurably improved our lives. It seems that Bed Bugs are a hot topic lately because of their recent virility and population boom in beds, homes, hotels and retails stores across the states. The Bedbug cam — an idea whose time has come. Bedbugs are more common than they used to be: Read this L.A. Times article about bedbugs from 2007, for example. That article quotes a fellow from the National Pest Management Assn., the same organization that just saw fit to alert the press today. Now I don’t want to promote a fear band wagon mentality. There is no reason to go ape-crazy on your house and family for no reason. Sprays and chemicals are expensive and time-consuming, disrupting our whole home life in the process. It’s good to get into center and think about topics like this from a balanced, practical, and calm perspective. Young Living has given us some alternative prevention techniques using their pure essential oils. Some of these tips and recipes are great for travel and home. So if you are on an extended stay at a hotel, or you want to proof your home from invasion here are some natural tips to do just that. Bed bugs are escalating because of global travel; the increase of homeless and underground communities; the popularity of “Flea” markets and 2nd-hand store merchandise. The escalation of bed bugs is alarming and people should be aware of the problem, how difficult it is to be rid of them, yet not be too discouraged, because there are natural, safe, chemical free ways to have those bed bugs be gone. Essential oil lovers prefer the Eco-friendly approach, and research shows that tree oils work best against parasites and menacing insects. Gary Young touts the praises of Palo Santo oil as the first choice for insect repellent. Palo Santo comes from an Ecuadoran tree which develops a resin to protect against infestation and it is from that resin that Young Living distills the Palo Santo oil. Eucalyptus has been used historically for bed bugs, and Eucalyptus Blue is the first anti-viral Eucalyptus Oil . Native American Indians relied on pine needles and Cedarwood chips in their mattresses to ward off ticks and fleas. Young Living essential oils are the essential oils that are being recommended for the following suggestions, as these essential oils are high quality therapeutic-grade essential oils. Combine with 4 oz. Distilled Water in a dark glass Spritzer bottle. via Bed Bugs Be Gone. There are a few more things you can do listed at the Young Living Circle blog for you to try as well. Thieves Household Cleaner: Experience the wonder of Thieves® Household Cleaner, as tough stains andproblem areas in your home become simple and easy to clean without using harsh or abrasive chemicals. Thieves Essential Oil is legendary as was proven at Weber State University to exhibit a kill rate of 99.96% against all airborne bacteria including MRSA, Staph, Strep, e-Coli and Toxic Black Mold. While bacteria can be dangerous, some industrial cleaners on the market pose an even larger threat to your health. Thieves Household Cleaner is a safe all-purpose “green” concentrate that can be used in every room in your home, without the harsh chemicals. Dilution ratios are listed on the label for your convenience. Women in labour are being offered relaxation and massage with essential oils as a natural pain-relief technique by midwives trained in aromatherapy at North Bristol NHS Trust. The techniques help ease labour pains, sickness, muscle aches and anxiety, and are being offered by a group of 24 midwives at Bristol’s Southmead Hospital’s birth suite, as well as to those who choose home births. Midwives have been taught how to mix oils and use their properties to relieve symptoms. Bergamot, clary sage, jasmine, lavender, peppermint, frankincense and grapefruit are the seven basic oils the midwives use, which are then mixed to a base oil. Up to three oils can be included in a mixture as appropriate to relieve the symptoms and can be applied through a drop on the hand, a compress to the skin, in a foot bath or by infusion through inhalation. Read the full article via Nursing in Practice – Aromatherapy to ease labour pains. I haven’t written about essential oils in a bit and I thought I would bring to you a favorite combination of scents which reminds Brandon of the South of France, Provence. In our diffuser we combine the pure scents of Lavender, Rosemary, and a bit of Lemon to create a fantastic summer blend in the house. It’s deep, bright, and fragrant tones fill the air. Lavender is fertile, clear, and soothing. Used in ancient cultures for birthing, as an offering at Midsummer, and throughout time as a remedy to relax. It is potent in working with the physical, emotional, and mental bodies. Lemon brings in a high note, reminding me of childhood as my Grandma Schwartz had a big lemon tree in the backyard. It promotes clarity of thought and purpose with a warm fragrance. In the book a compendium of HERBAL MAGICK, Paul Beyerl, we find has the qualities of an aphrodisiac and is associated with love. The Modern Herbal, Simon Y. 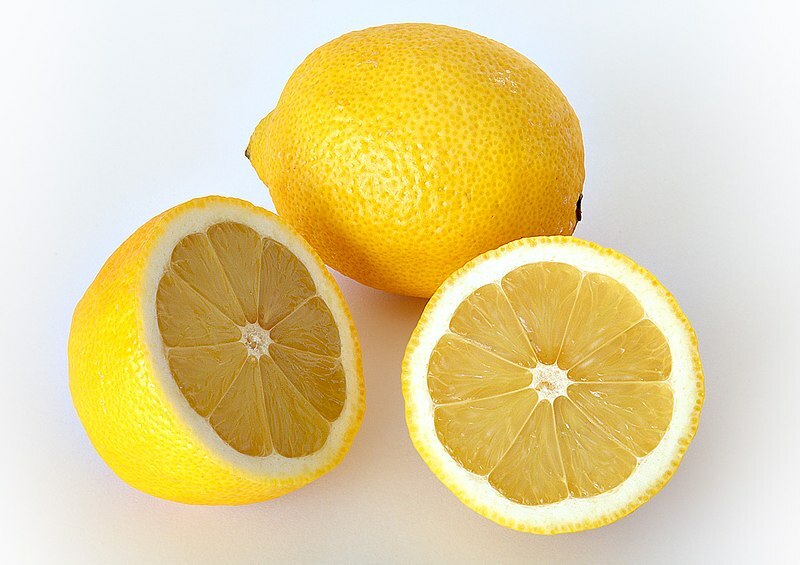 Mills, notes the effects that lemon can have on tension and anxiety. Rosemary is another favored herb of mine, and known throughout the ages for its uplifting scent. We see it used for anything from headache, tension, and depression. It is sharp, focusing and helps with clarity. I find that rosemary’s rich history of use in religious rites from weddings to funerals very proper since it primarily excites clarity and memory. Magickally it is related to the sun and is associated with Wisdom, and love, of loyalty, and fidelity. Personally I like to combine the use of Rosemary when working with any Greek Deity… I am not sure that there is an association beyond my own personal draw to the scent, but I mark the fragrance as a power herb. Combined the scent is refreshing, clearing, soothing, balancing, and thus empowering for good conversation, time together, and an overall centralizing scent for our home environment. Naturally I’m going to point you towards Young Living. If you have other access to good quality essential oils through another source, and a diffuser, I suggest you try this blend out. It rocks! In the diffuser I combine 6 drops of Lavender, 6 drops of Rosemary, and 6 drops of Lemon. Diffuse for 10-15 minutes, up to once an hour. Young Living Virtual Catalog is out ~ HUZZAH! It’s out. For members, the catalog is out. For you, I’ll post it on the Journey. I have a hard copy at home. Don’t hesitate to send me an email. Go green and view Young Living’s product guides and seasonal catalogs right within your web browser. Catalogs open in a virtual viewer. Turn the pages, click on any product for more information, and enjoy. You can view Young Living’s Lifestyle magazine online, too! It’s easy to begin your essential oil journey. Signing up below allows for you to receive email updates from Lifencompass about YL products and when you are ready to begin, to join Young Living in integrating these powerful healing oils into your life. Make a healthy choice every day, no matter what you choose. Or make a donation, that always brings a smile.